Please click here to view a PDF version of the August 2018 report. Please click here to view a PDF version of the June 2018 report. 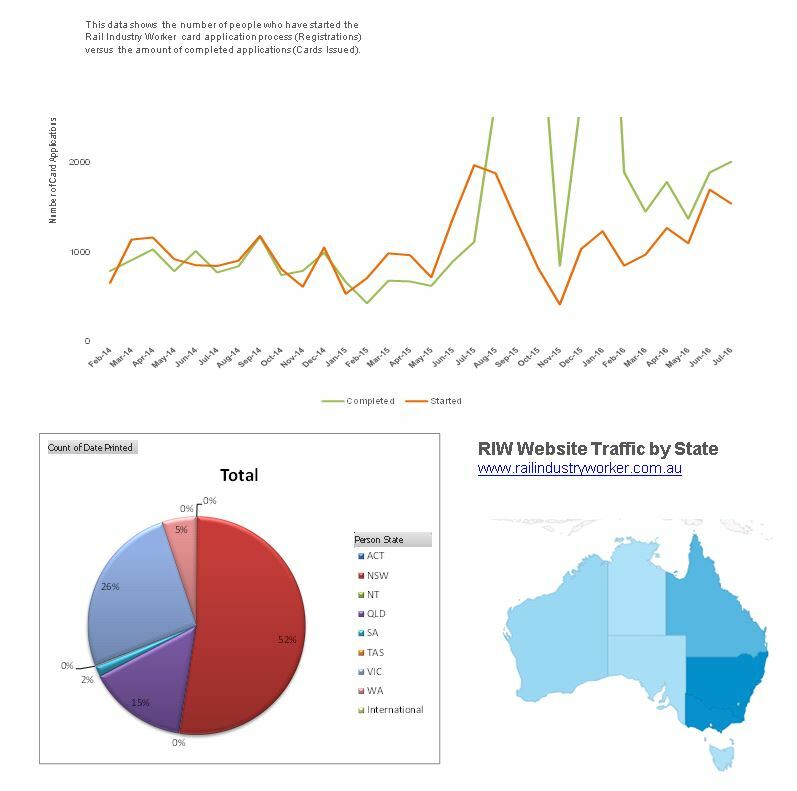 Please click here to view a PDF version of the May 2018 report. 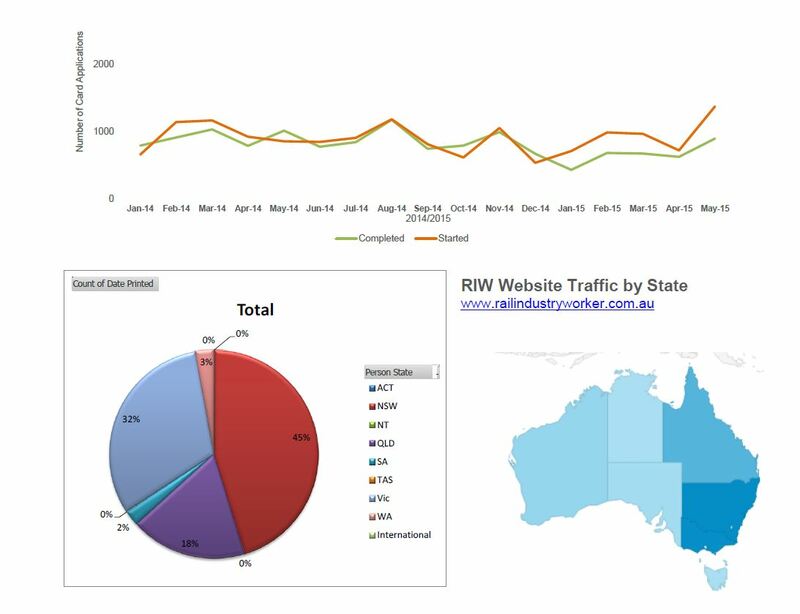 Please click here to view a PDF version of the April 2018 report. 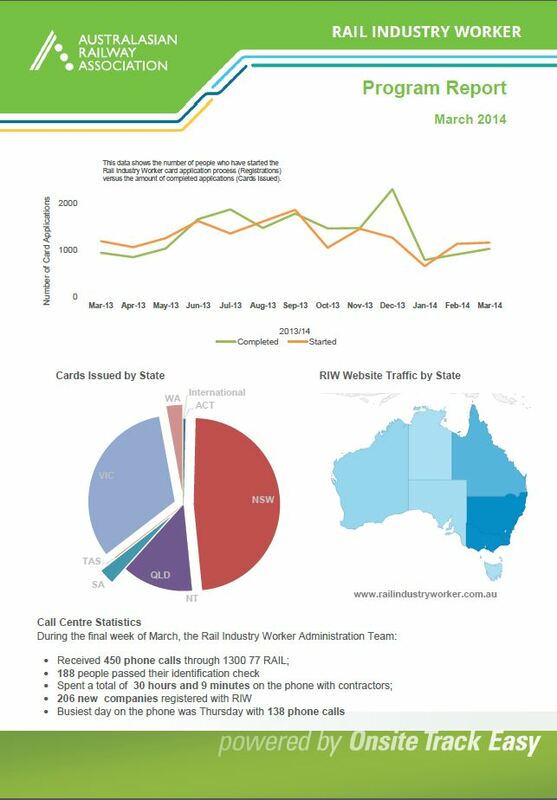 Please click here to view a PDF version of the March 2018 report. 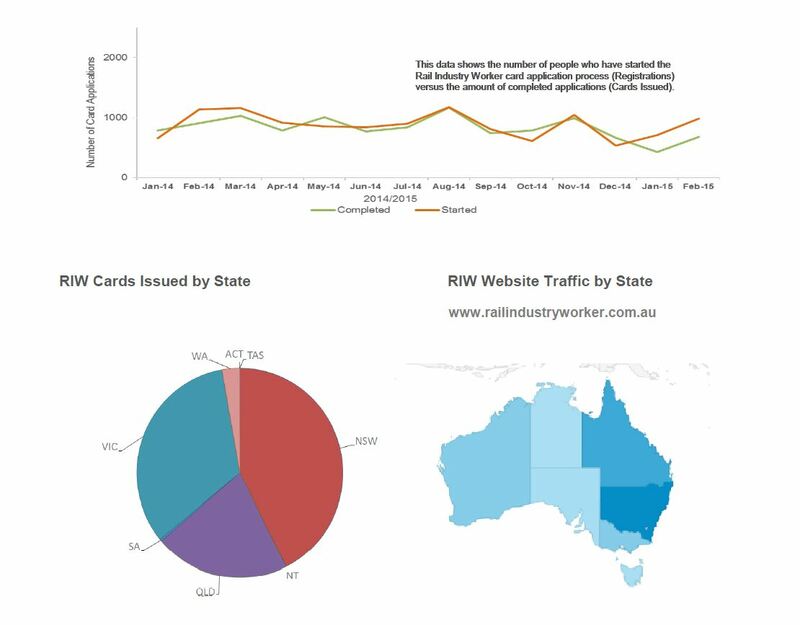 Please click here to view a PDF version of the February 2018 report. Please click here to view a PDF version of the January 2018 program report. 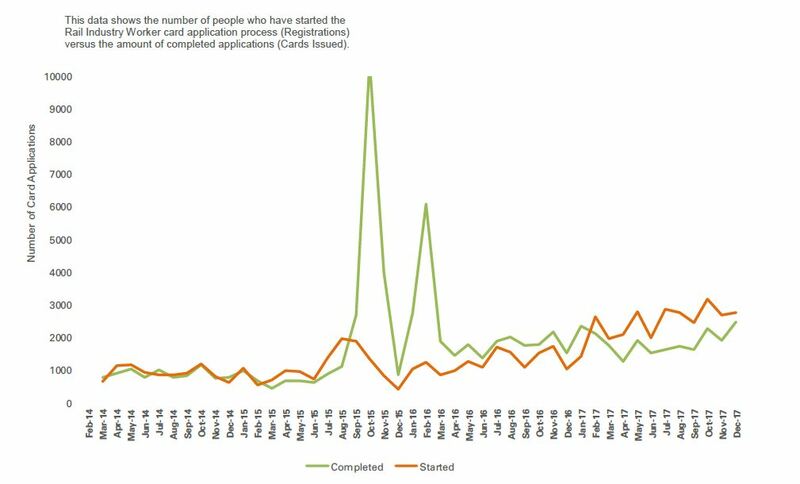 Please click here to see a PDF version of the December 2017 report. 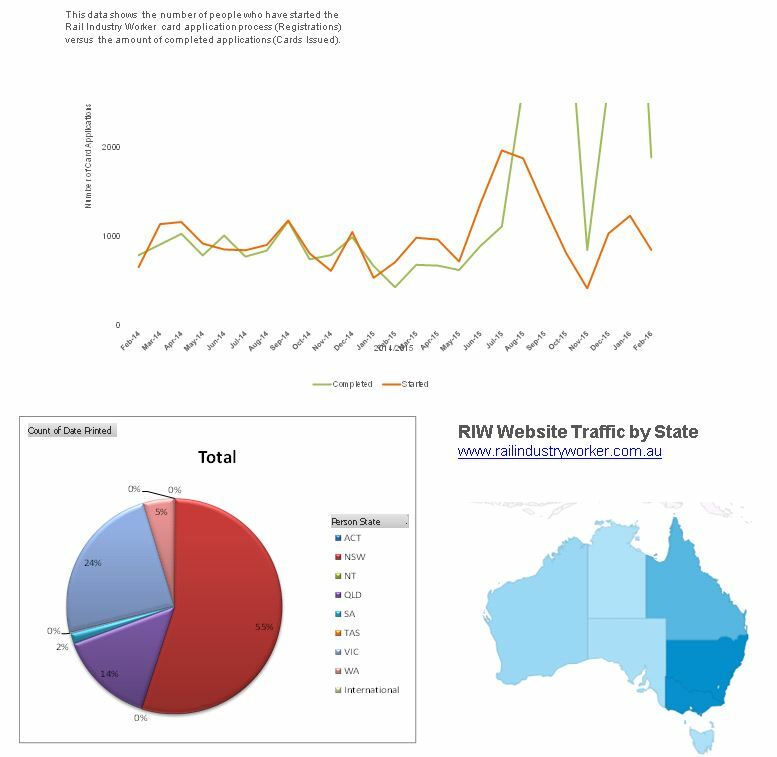 Please click here to see a PDF version of the November 2017 report. 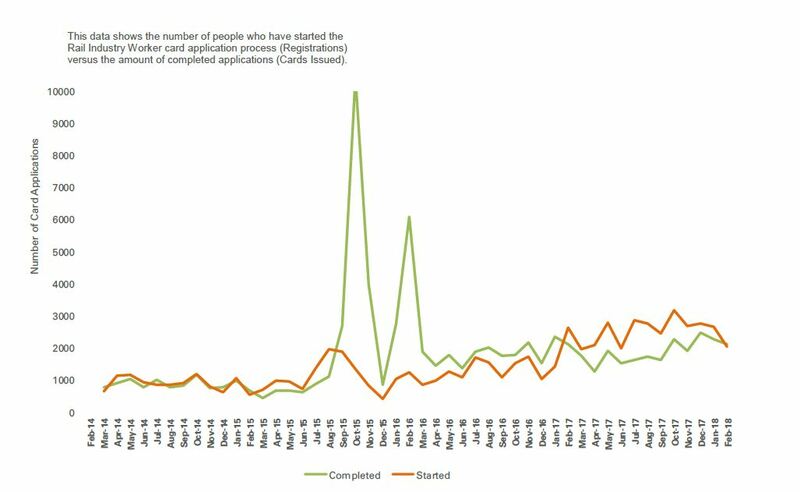 Please click here to see a PDF version of the October 2017 report. 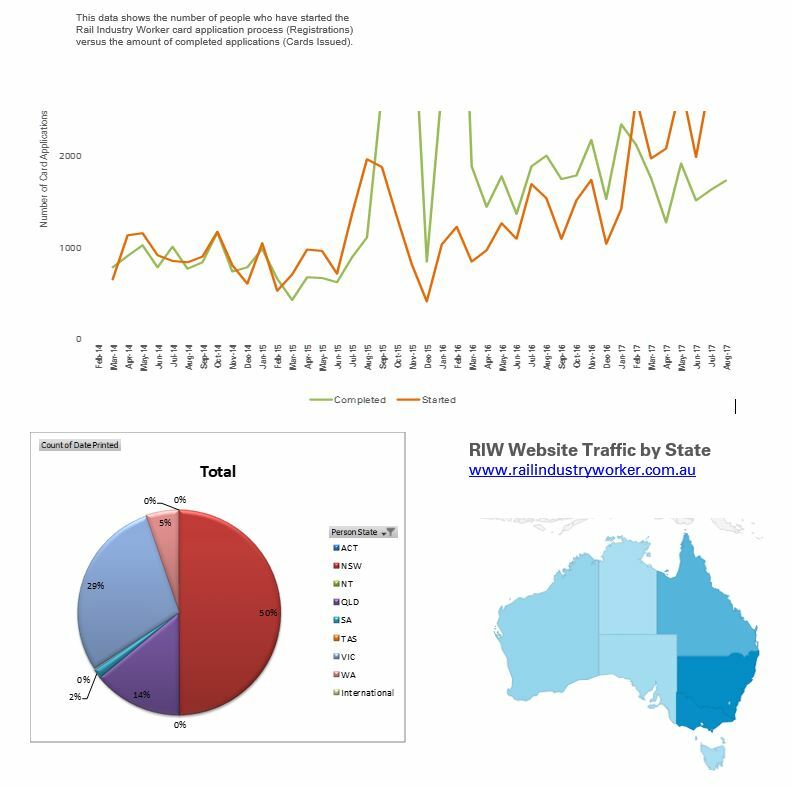 Please click here to see a PDF version of the September 2017 report. Please click here to see a PDF version of the August 2017 report. 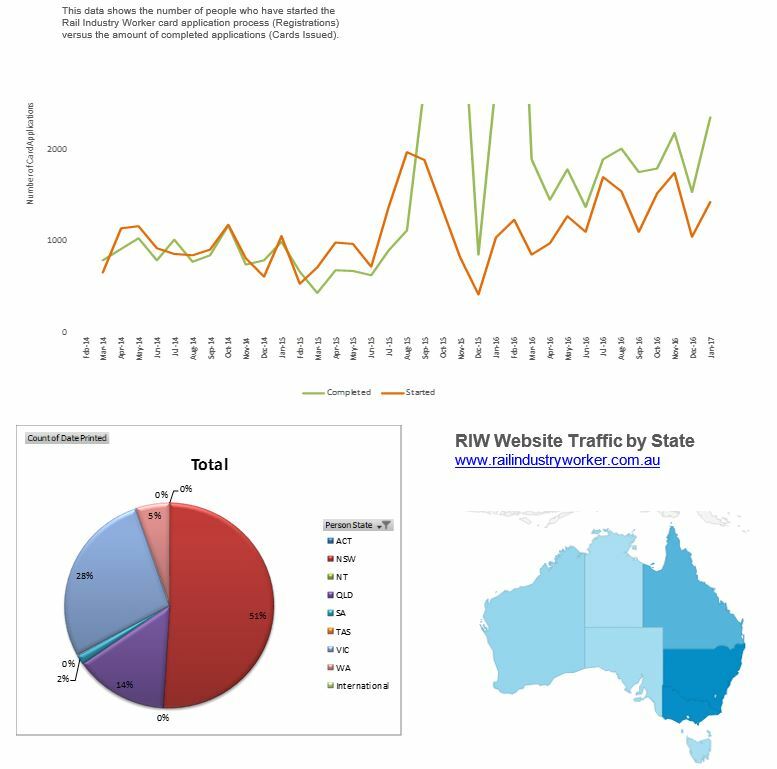 Please click here to see a PDF version of the July 2017 report. 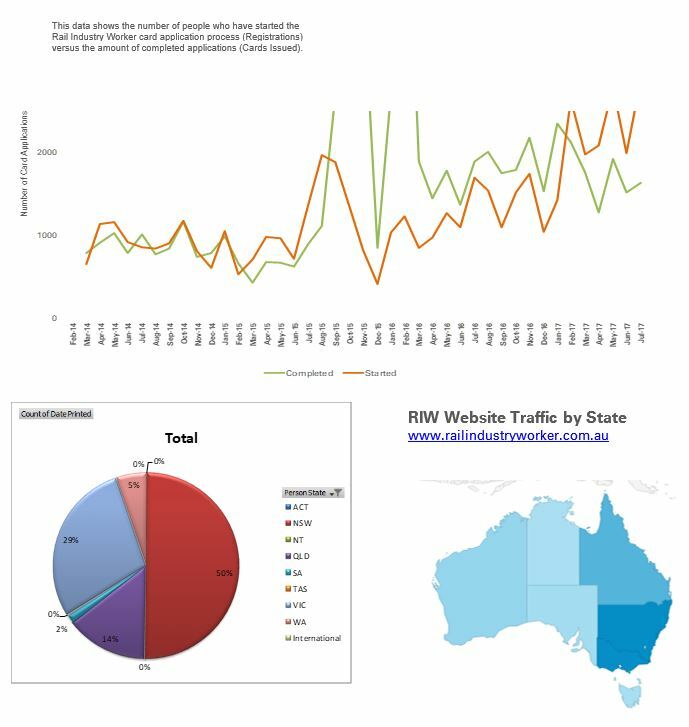 Please click here to see a PDF version of the June 2017 report. 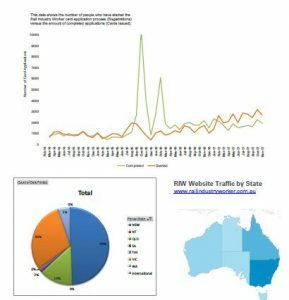 Please click here to see a PDF version of the May 2017 report. Please click here to see a PDF version of the April 2017 report. 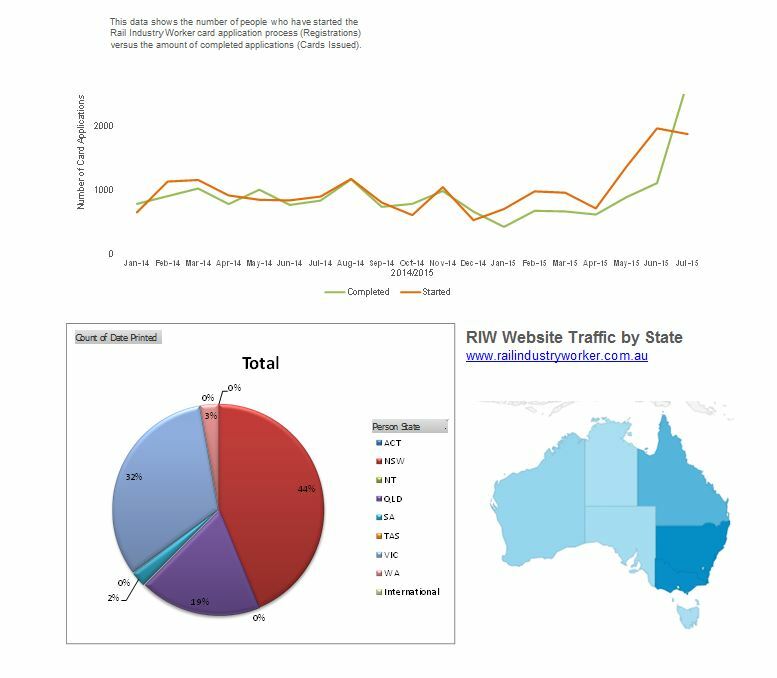 Please click here to see a PDF version of the March 2017 report. Please click here to see a PDF version of the February 2017 report. Please click here to see a PDF version of the January 2017 report. Please click here to see a PDF version of the December 2016 report. Please click here to see a PDF version of the November 2016 report. Please click here to see a PDF version of the October 2016 report. 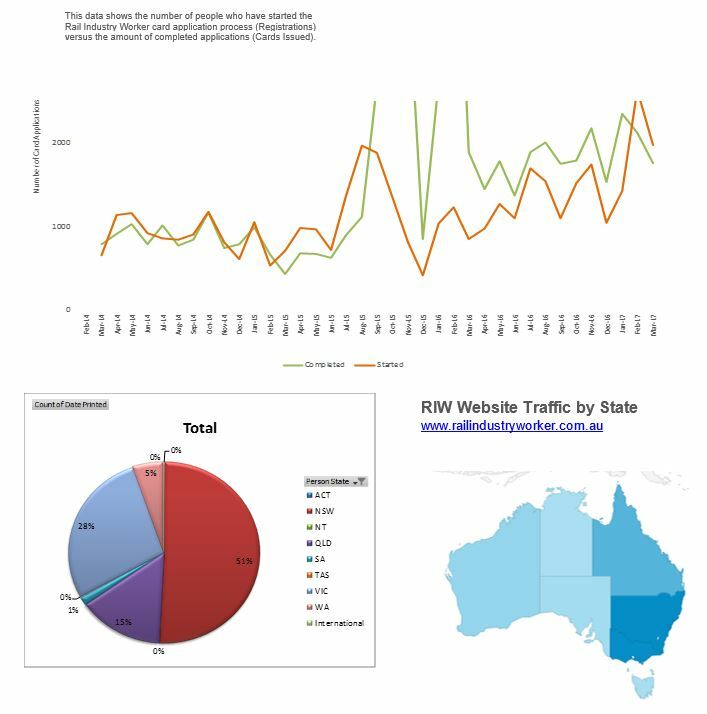 Please click here to see a PDF version of the September 2016 report. 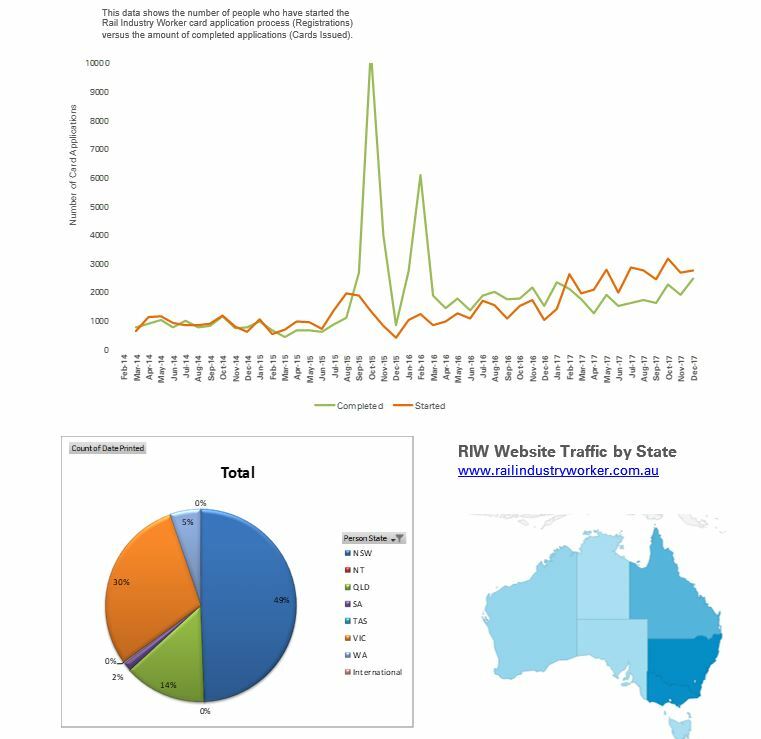 Please click here to see a PDF version of the August 2016 report. 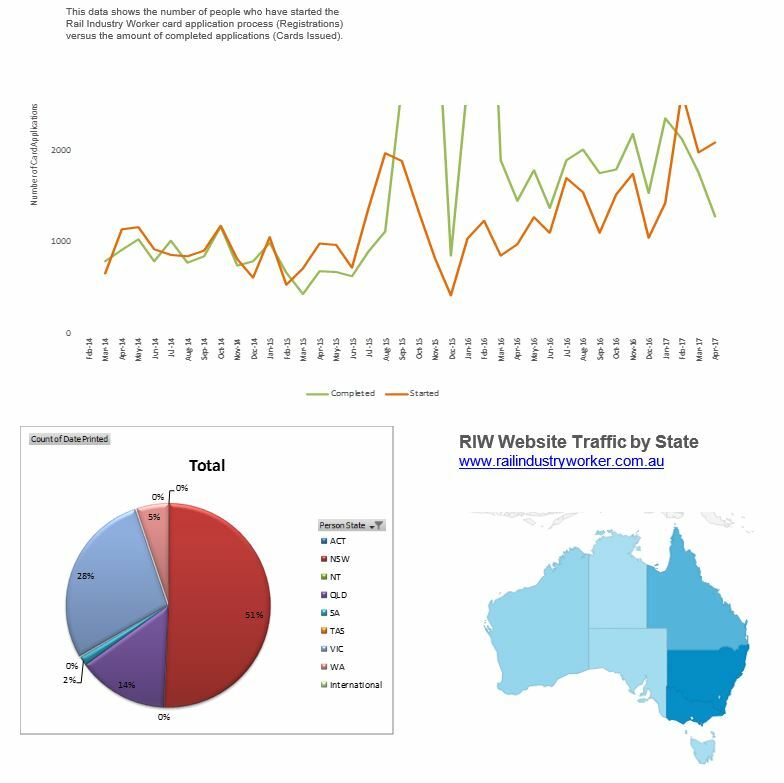 Please click here to see a PDF version of the July 2016 report. Please click here to see a PDF version of the June 2016 report. 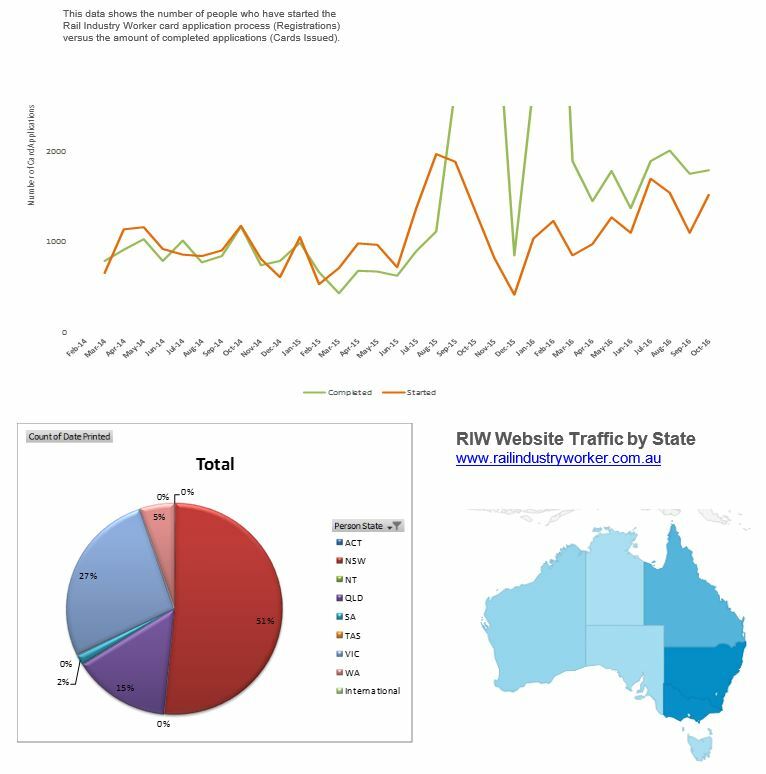 Please click here to see a PDF version of the May 2016 report. 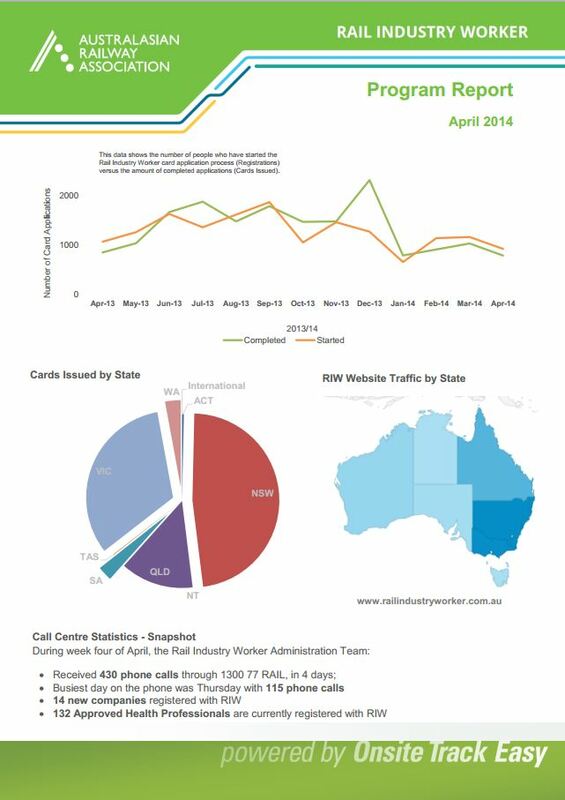 Please click here to see a PDF version of the April 2016 report. 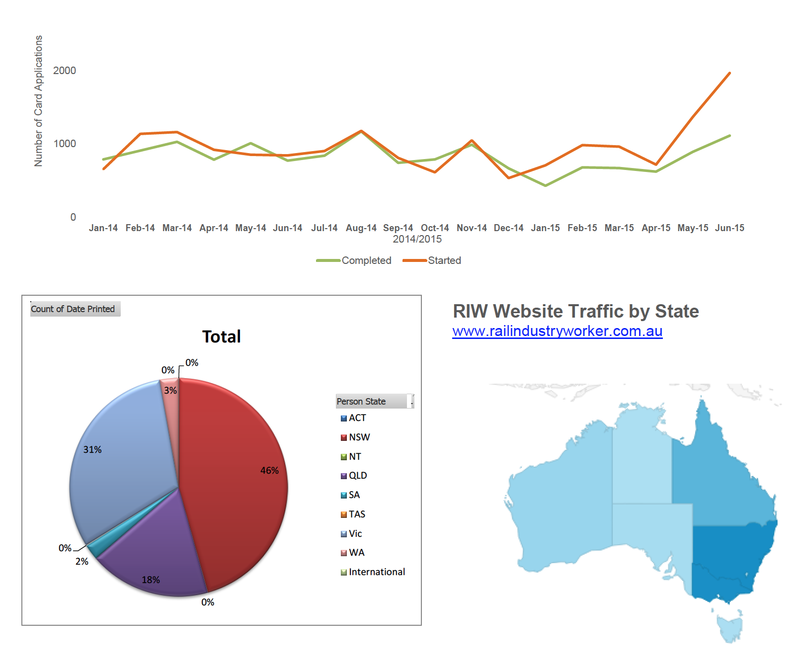 Please click here to view the March 2016 RIW Program Report. 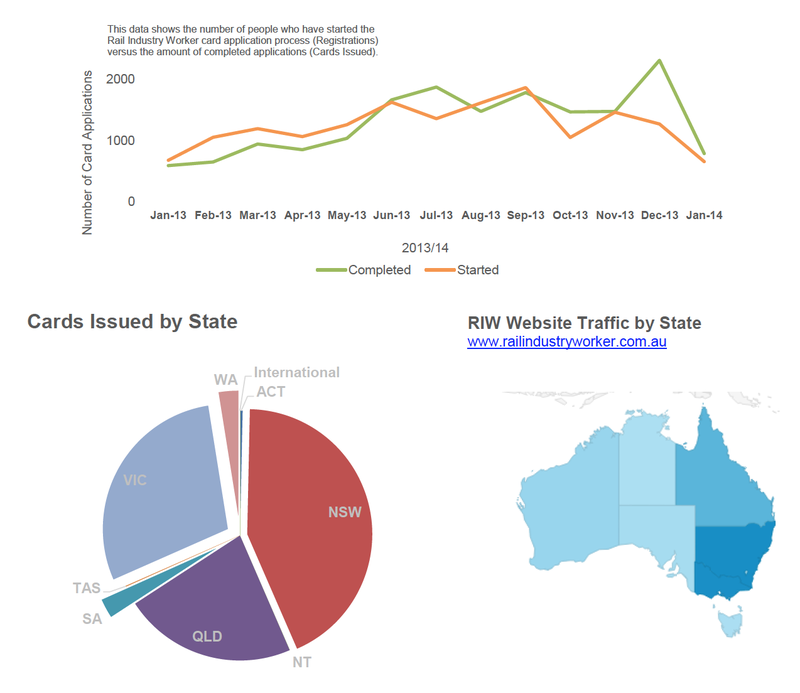 Please click here to see a PDF version of the February report. 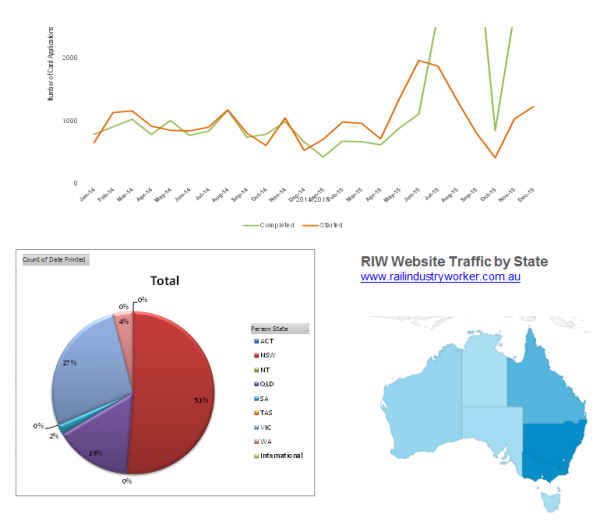 Please click here to see a PDF version of the January report. 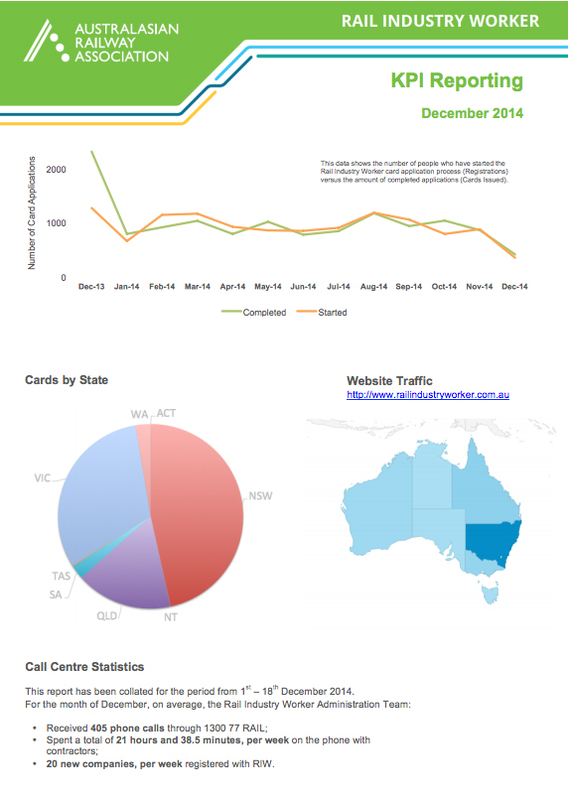 Please click here to see a PDF version of the December report. 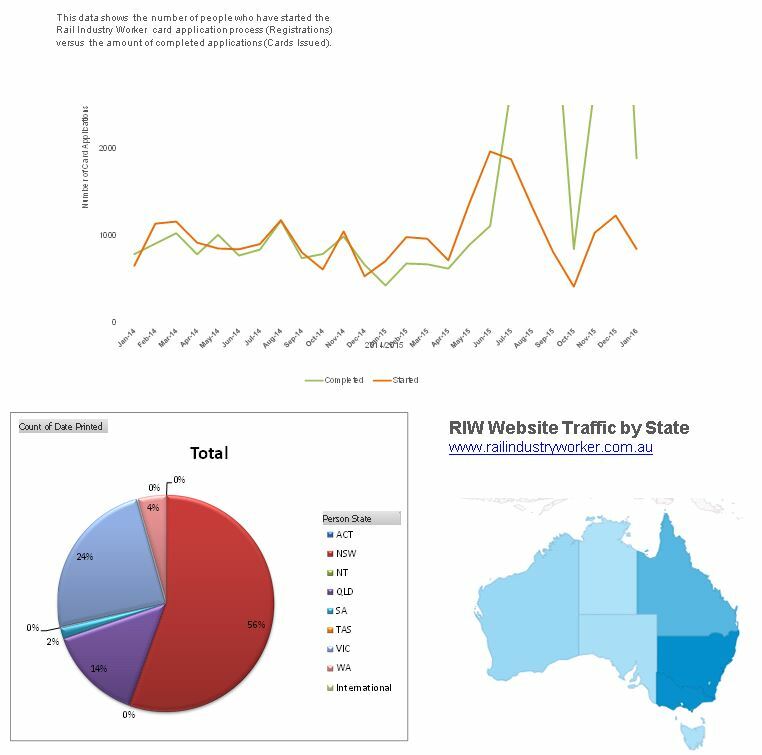 Please click here to see a PDF version of the November report. 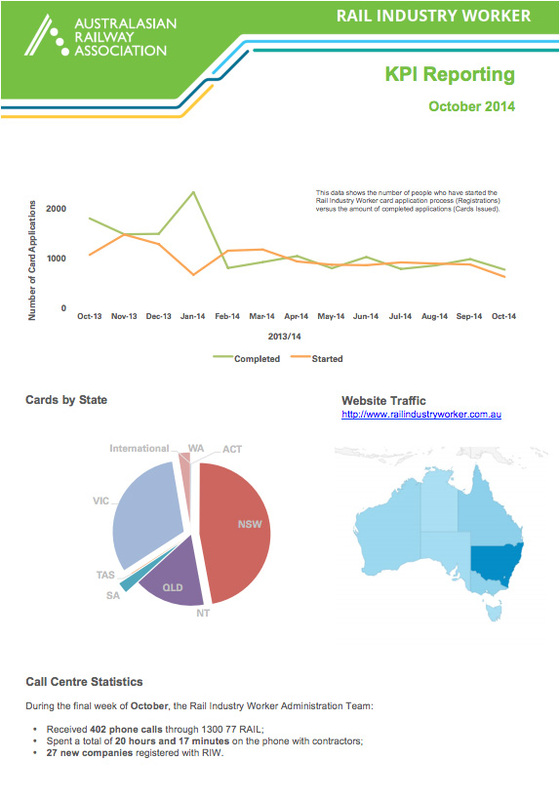 Please click here to see a PDF version of the October report. 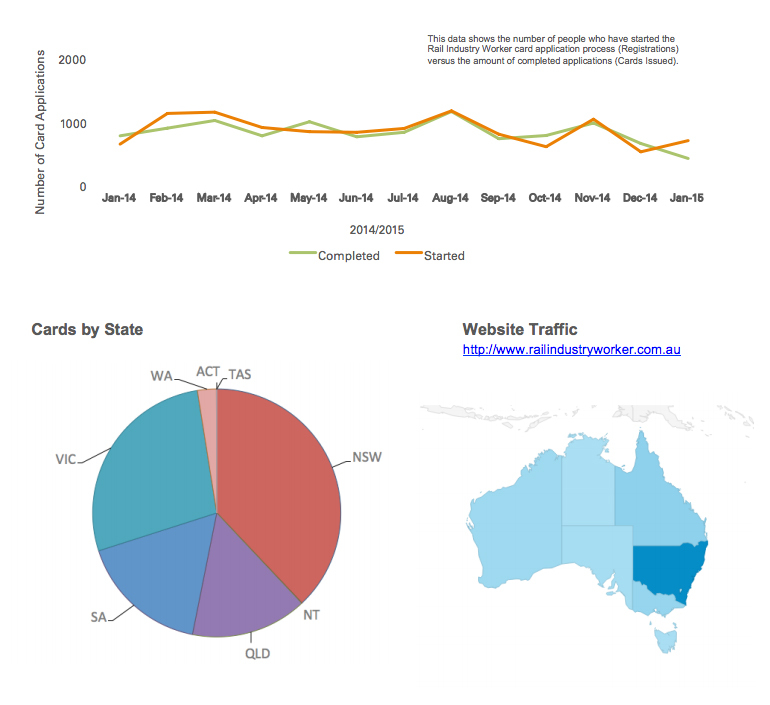 Please click here to see a PDF version of the September report. Please click here to see a PDF version of the August report. 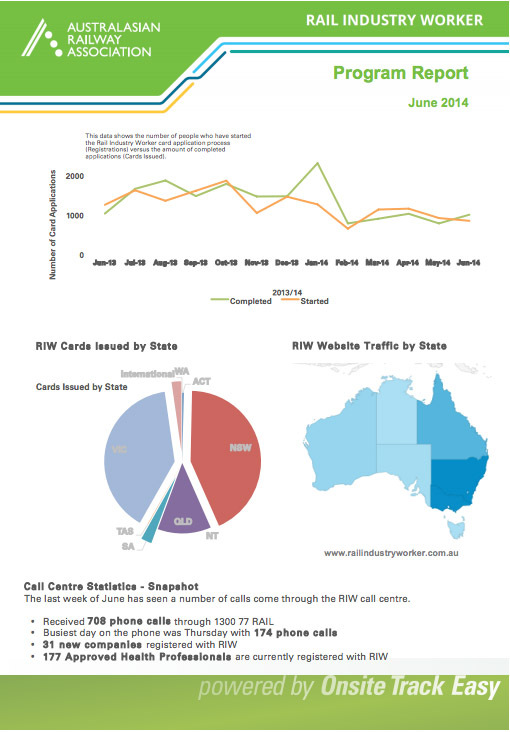 Welcome to the March edition of the RIW end of month Report. 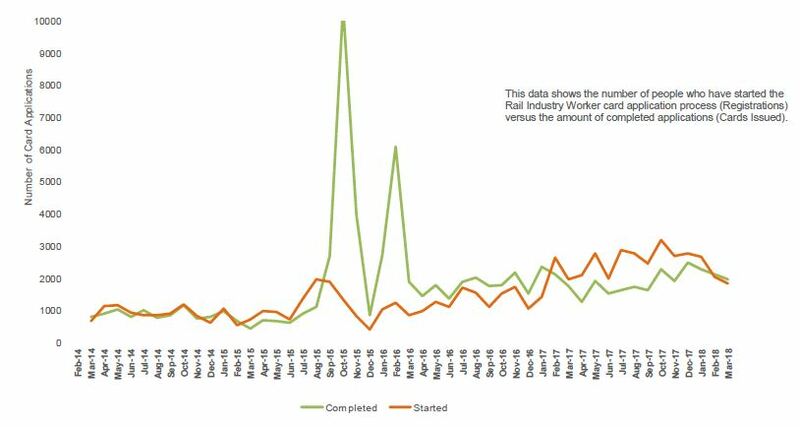 March has seen 115 new companies register. 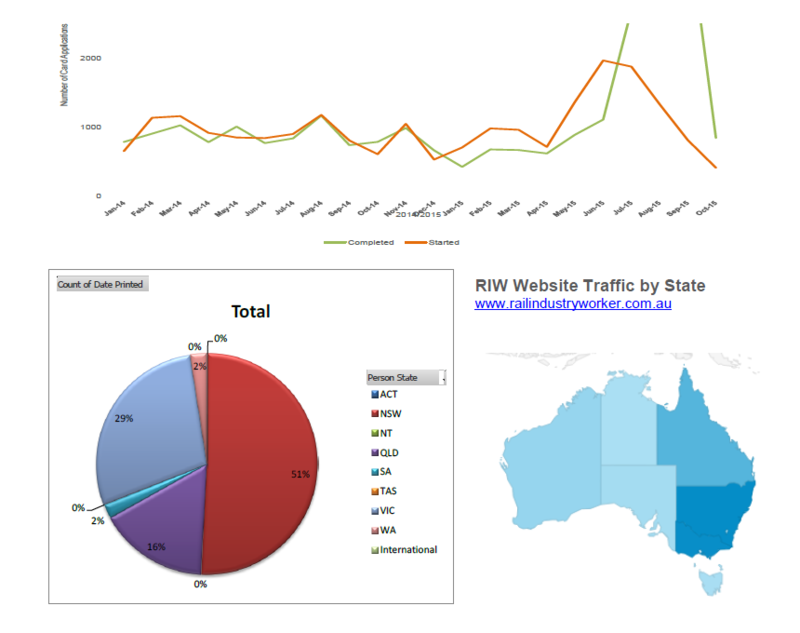 Welcome to the February Edition of the RIW end of month report. 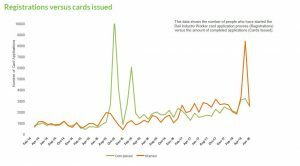 February has seen 88 new companies register. 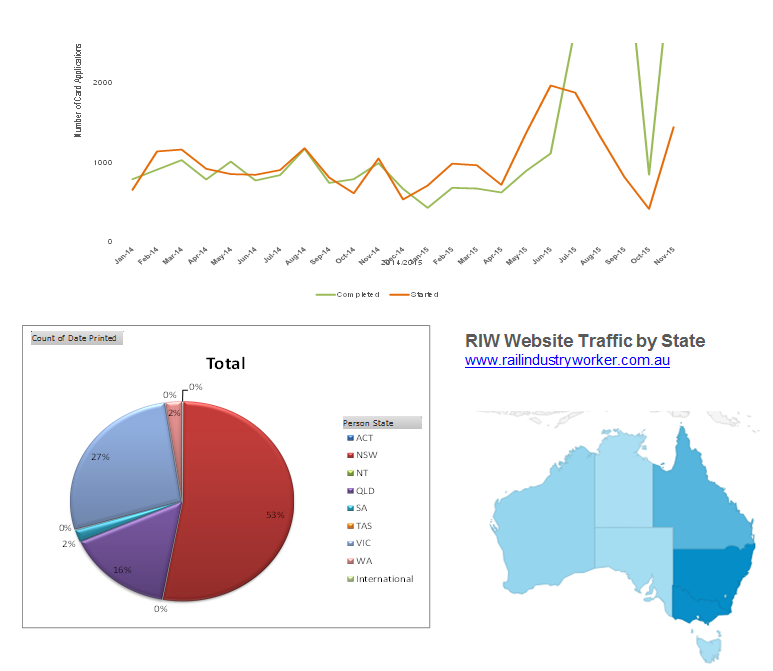 Welcome to the first program report for 2015. 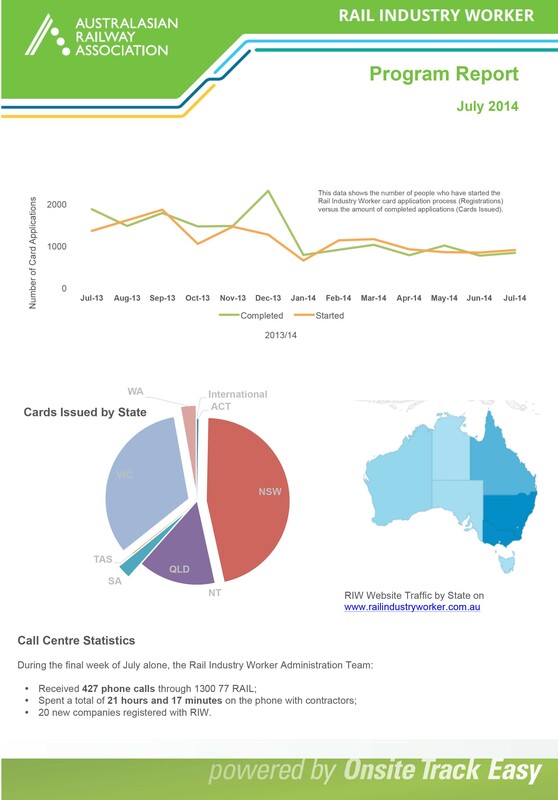 January has seen 57 new companies register with the Rail Industry Worker Program, nationally. Please CLICK HERE to view a pdf version of the January report. 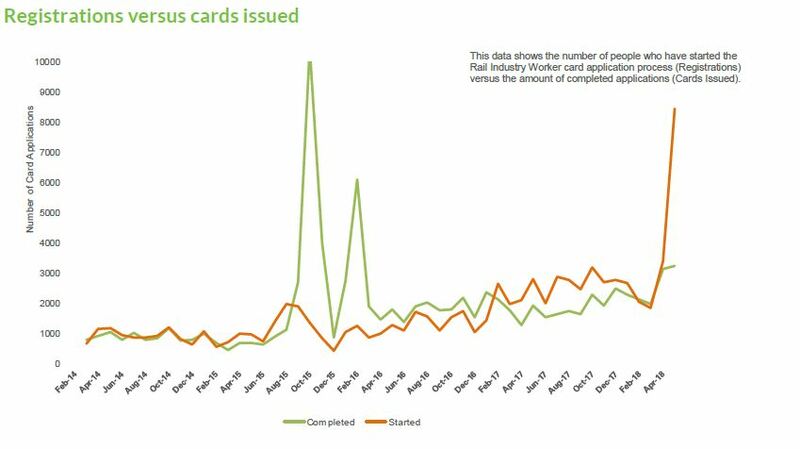 The Rail Industry Worker program saw an average of 20 companies per week register, this month. 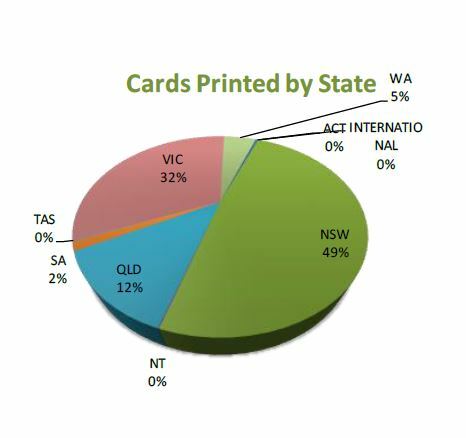 For the final month of 2014, New South Wales now makes up the majority of all Rail Industry Worker card holders. 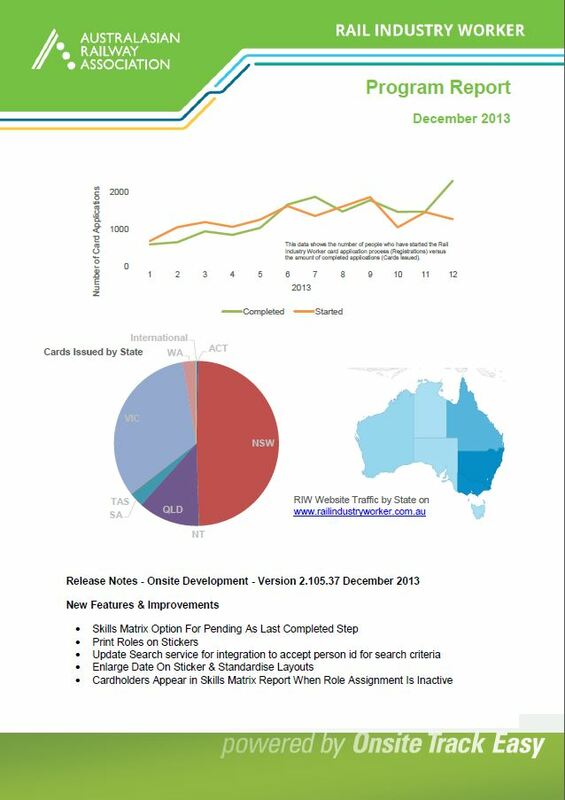 Please CLICK HERE to view a pdf version of the December report. 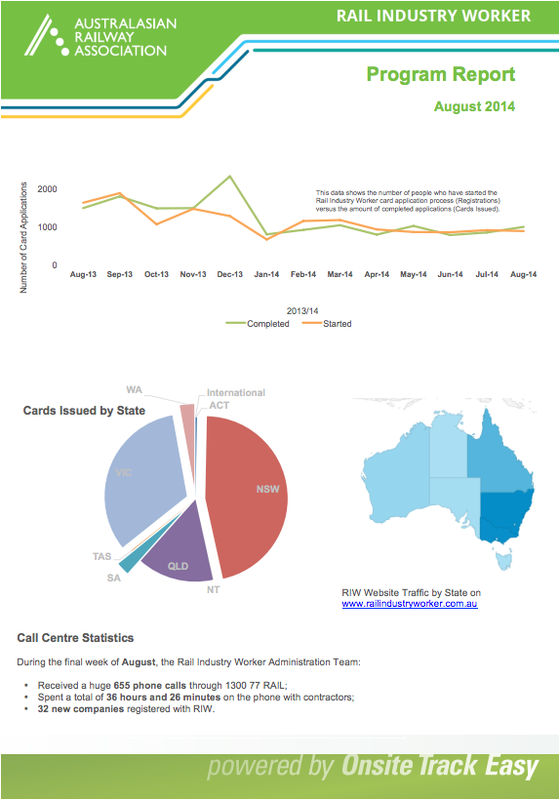 For the month of October, we have welcomed a number of new companies to the Rail Industry Worker Program. 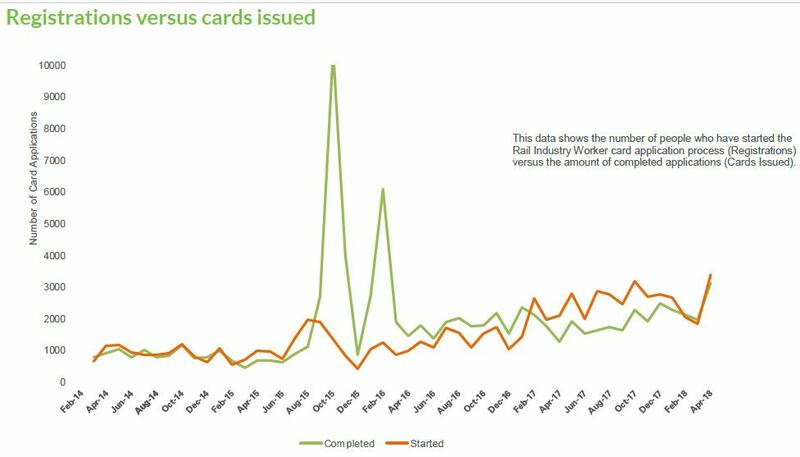 The October report has shown us that almost half of all Rail Industry Worker card holders are based in New South Wales, with Victoria holding almost 30%. 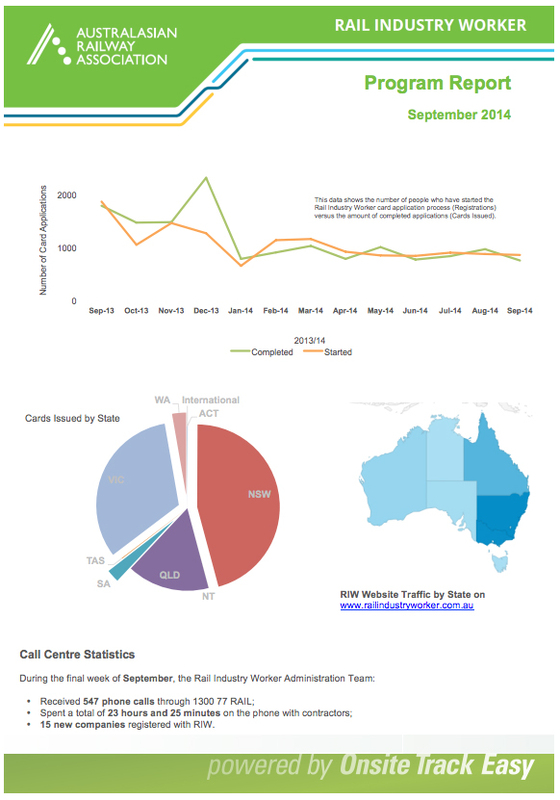 Please CLICK HERE to view a pdf version of the October report. 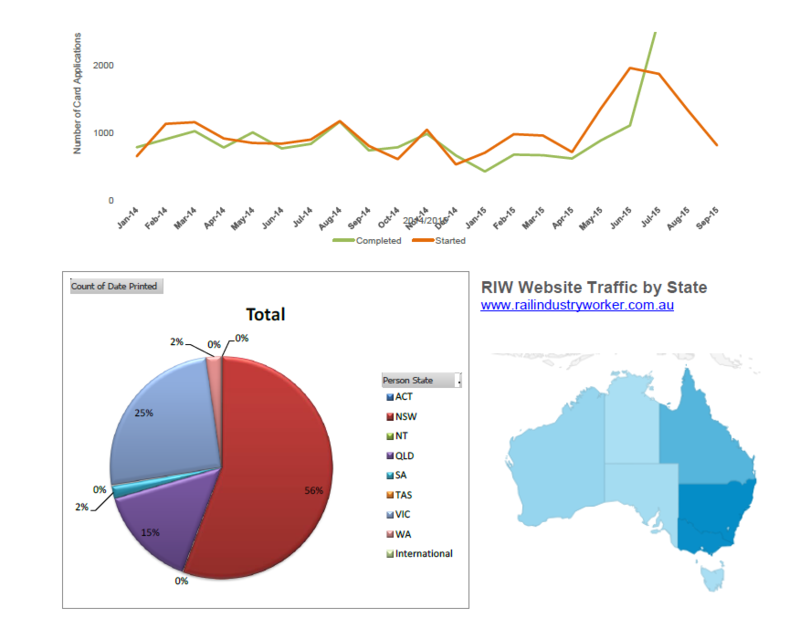 We have welcomed 58 new companies to the RIW Program this month. 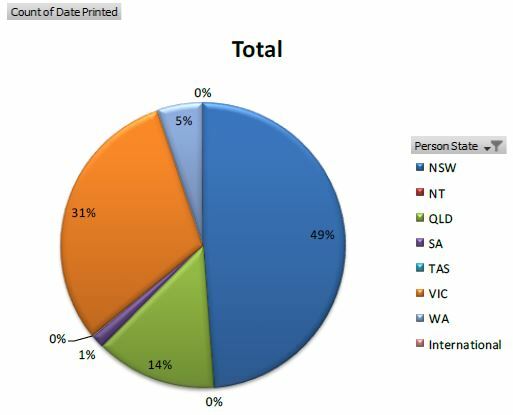 Please CLICK HERE to view a pdf version of the report. 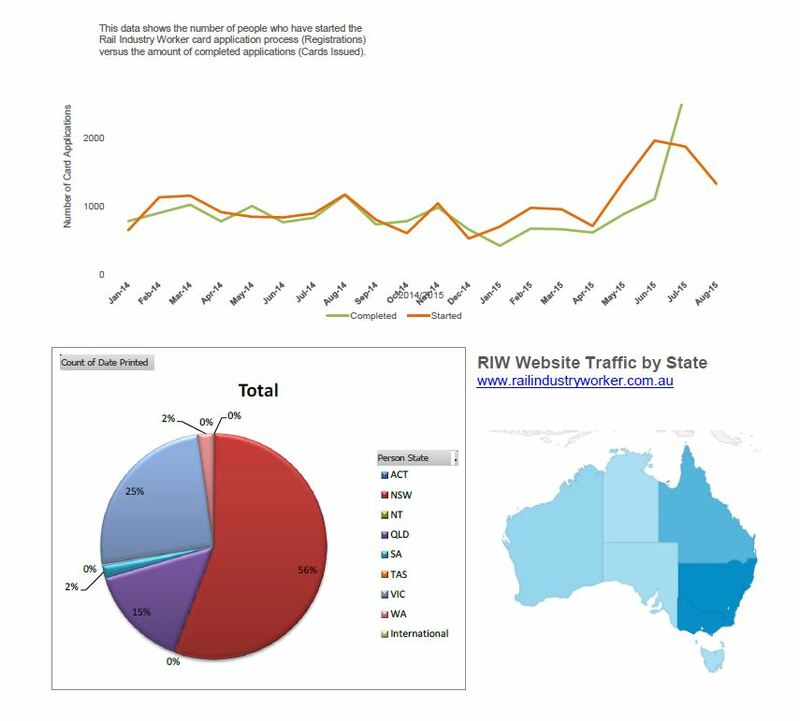 Remember to register, via railindustryworker.com.au/news, to receive future updates. 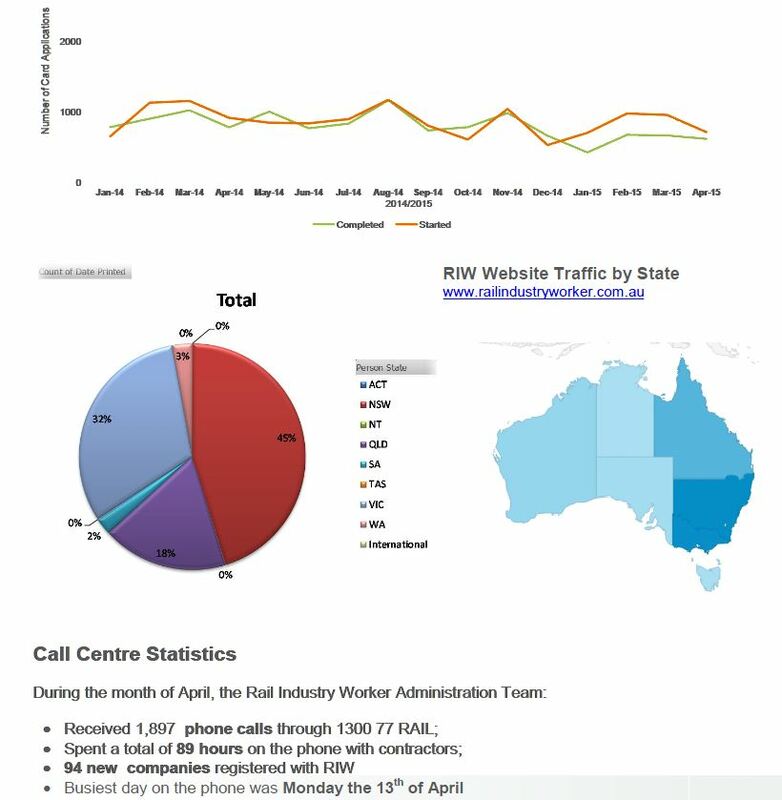 With over 655 phone calls taken in the last week of August alone, it has been a big month in the RIW Call Centre. 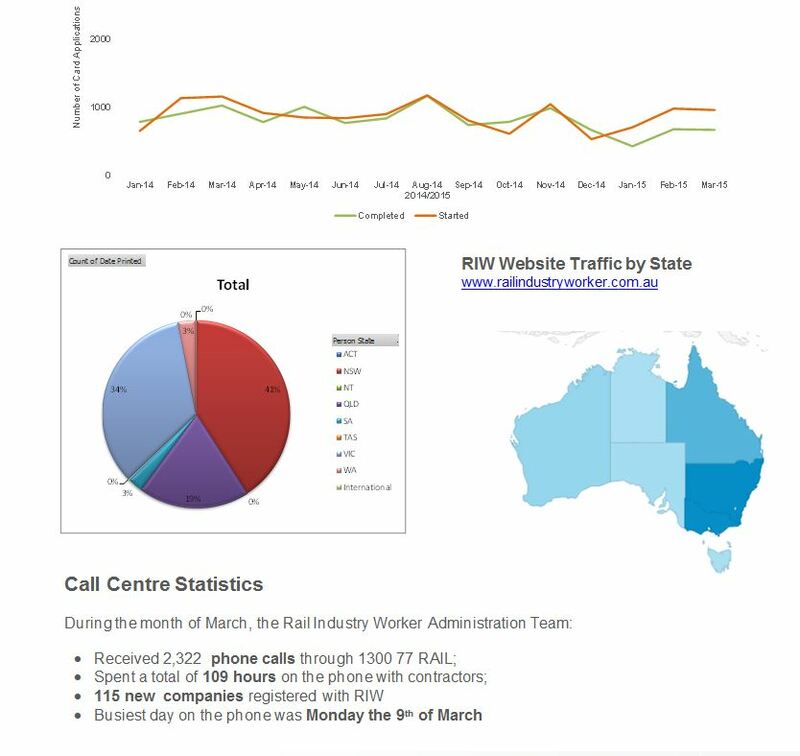 It has been a busy month in the RIW Call Centre. 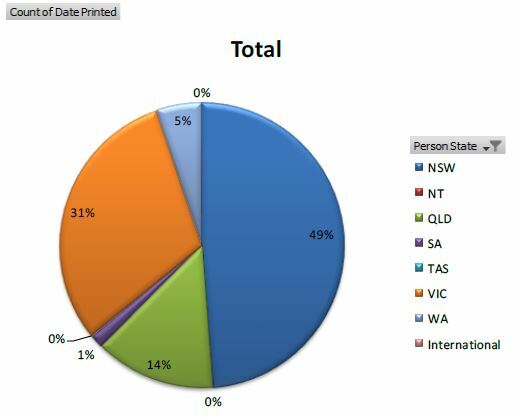 The last week of July saw over 400 calls taken through 1300 777 245. A significant increase in the number of RIW cards issued throughout VIC this month. 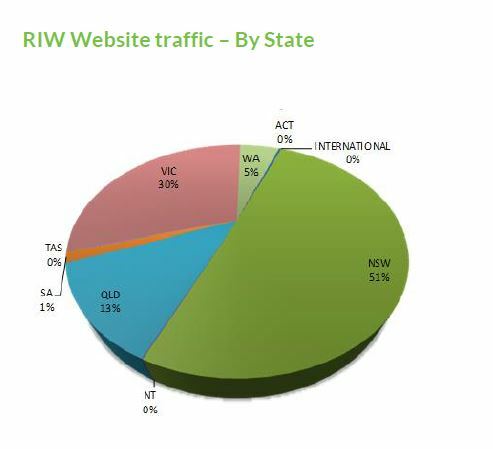 May has seen an increase in the number of AHP’s registered with the RIW program. 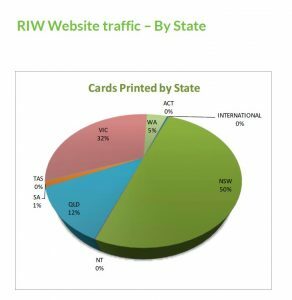 Despite a few short working weeks in April, the RIW call center has seen a number of new companies register and cards distributed. Please see below for further insights. 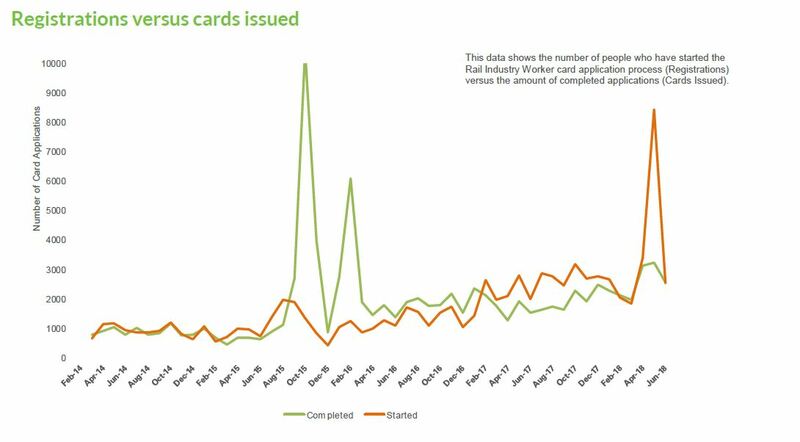 March has been a productive month for the Rail Industry Worker Program, with a number of new RIW card holders in Victoria. Please see below for further insights. 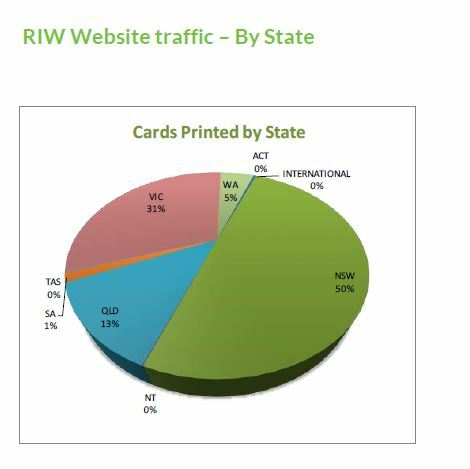 The January 2014 Report, highlights the growth and development of the RIW program over the last twelve months, with an increase of nearly 2000 more companies registered, than this time last year! 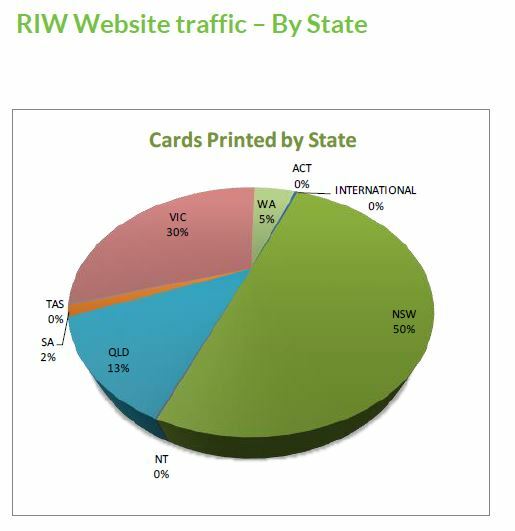 The Program Report for December 2013 has highlighted a year of unprecedented growth and use of the RIW card. 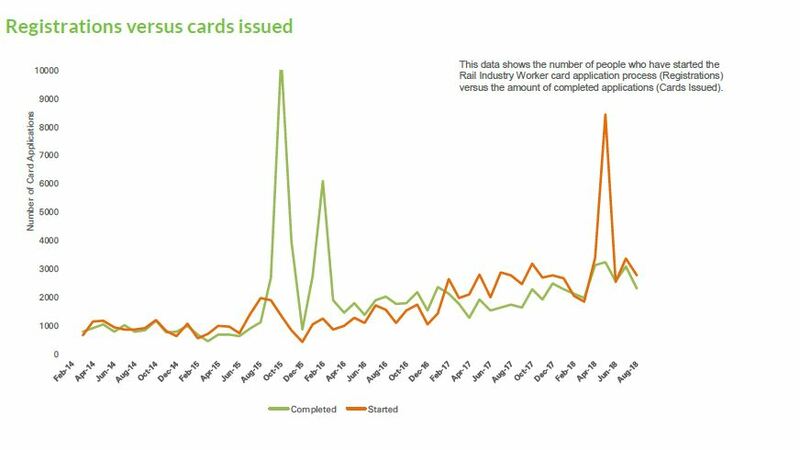 December alone has seen a dramatic increase in the number of cards completed and issued, as well as a number of improvements and features introduced within the Onsite Track Easy system.